(Phys.org) —A team from Harvard and MIT presented their work at the 2013 IEEE International Conference on Robotics and Automation (ICRA) in Germany. Their contribution: "Robot Self-Assembly by Folding: A Printed Inchworm Robot." The authors, Samuel M. Felton, Michael T. Tolley, Cagdas D. Onal, Daniela Rus, and Robert J. Wood are from the School of Engineering and Applied Sciences; the Wyss Institute for Biologically Inspired Engineering, at Harvard, and the Computer Science and Artificial Intelligence Laboratory at MIT. They presented their printed inchworm robot that can assemble itself. Felton did the introductions in a video of the self-folding device. "Our goal is to make robots that can be printed as quickly and cheaply as possible," he said, "and the goal of this specific project is to design them so they can fold themselves." They chose the inchworm robot design to show the merits of their technique. He said the gain is tied to the fact that "often we have these complicated robots that can take up to an hour to fold." This robot uses shape-memory polymers (SMPs) for the self-folding process. These are "smart" materials that can go from one state to another via a stimulus such as temperature change. With the SMPs, the inchworm robot is able to fold into desired shapes. Once it folds, a battery and motor are attached. With enough current, the team's robot was able to fold into its functional form with fold angle deviations within six degrees. The printed robot demonstrated locomotion at a speed of two millimeters per second. The team said printing and folding are fast and inexpensive methods for prototyping complex machines. "Self-assembly of the folding step would expand the possibilities of this method to include applications where external manipulation is costly, such as micro-assembly, mass production, and space applications." 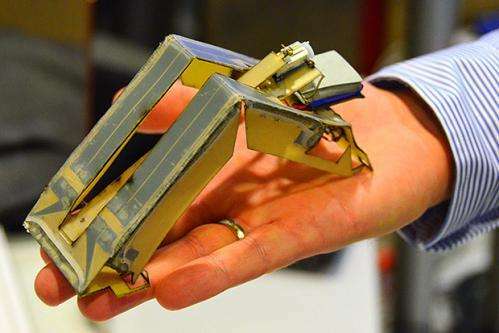 Their paper's intent was to demonstrate a method for self-folding printed robots, they said, from two-dimensional materials based on shape memory polymers actuated by joule heating using embedded circuits. They found their method succeeded in performing sequential folding, angle-controlled folds, slot-and-tab assembly, and mountain and valley folds.